Cute small wooden huts are an excellent choice as a retreat for couples wanting to get away from the hustle and bustle of everyday life. Here, sleeping in nature takes on a whole new meaning. The huts are made of unprocessed larch wood and covered with larch shingles. The comfortable bed is made entirely from natural materials. The smell of wood pervades the entire hut. In front, you will find beautifully landscaped surroundings with typical Alpine plants, a wooden bathtub heated by firewood and comfortable wooden patio chaise lounges. 12 wooden huts in a secluded part of the green camp right next to Lake Bled. The dwelling is suitable for up to two persons. 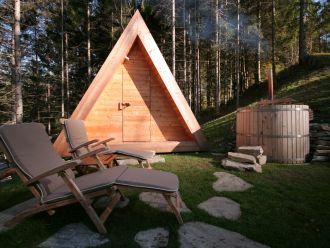 The wooden outdoor bathtub heated by firewood is another amenity that will make your stay even more comfortable. In front of the hut there is a shade sail, two loungers and a small table. The camp is located 7 km from the motorway exit. The camp is accessible to maxi campers and multi-axle caravans. The camp is open from 1 April until 15 October. You can enter the camp with your vehicle between 7.00 and 23.00. The house is equipped with electrical outlets. Guests can borrow extension cords and adapters free of charge at the camp's Reception desk. The camp has five toilet and shower blocks. Private bathrooms are available for rent. Two toilet and shower blocks are heated both before and after the season. There are token-operated washers and dryers in one of the bathroom facilities. Tokens can be bought at reception. The entire camp is covered by the Wi-Fi signal. Wi-Fi is free for camp guests. A computer is available to guests at the Reception desk. The service is charged according to the regular price list. Glamping guests can order dinner in the bathtub and choose from a variety of sparkling and still wines. The camp has a supermarket that is open seven days a week. The camp has a mobile bakery on wheels that delivers bread and pastries right to your tent's "doorstep". A starting point for hiking, cycling, swimming and running. Portable refrigerators are available for rent. The central waste collection point is just outside the campsite entrance. There are no bins in the campsite. Guests can settle the bill in a foreign currency. The Reception does not, however, provide currency exchange services. Traveller's cheques can only be cashed in banks. Prior to their arrival to the camp, guests can fill in a registration form and send it to the Reception desk, thus expediting the check-in process at the camp so that guests can begin enjoying their vacation even faster. There is a parking lot near the glamping huts. Parking at the huts is prohibited. The carwash is token-operated. Tokens can be bought at reception. Cosy wooden hut made of from larch wood. The hut offers two beds with a mattress and bedding made of natural materials. Guests can enjoy themselves on the set of wooden deckchairs and table provided in front of the hut. Living in nature is a luxury in and of itself. You can enhance it with various wellness services. At the Živa Wellness centre of the Rikli Balance Hot ...el, you can discover special Alpine wellness programmes, massages and baths. At the Luisa Studio at the Grand Hotel Toplice, you will find an elegant swimming pool with a healing thermal mineral water spring. The guests of Camping Bled can use their card to open the camp gate and also claim a 50% discount on tickets for the thermal swimming pools of the Živa Wellness centre. In addition to making their own culinary creations in the well-appointed kitchen, guests have a multitude of options for discovering the flavours of t ...he local cuisine. These are offered by the mobile bakery, the restaurant at the camp's entrance and finally the picnic baskets. While strolling through Bled, stop at the Park Café, the Panorama Restaurant or the Jezero Lunch Bar and select something that piques your fancy. Whether you decide on a delicious original Bled cream cake or excellent natural ice cream at the café, the true Slovenian Carniolan sausage with žganci and štruklji at the Panorama Restaurant or a masterpiece created by the multiple award-winning chef at the Jezero Launch bar, you will always be served the most amazing view of the lake. Treat yourself to a delicious meal in the fresh open air. The culinary masters of Grand Hotel Toplice***** will prepare a basket full of goodies for y ...ou to enjoy for your breakfast or a romantic dinner in front of your forest villa, or indeed to take with you on your exploration of the surrounding nature.